A large part of Zilina’s terrain consists of forests and valleys bordered by mountain ranges. The beauty of its surroundings, the diversity of its topography, and its bountiful cultural and historical monuments all contribute to Zilina’s charm. Hunting and fishing have been popular activities here for centuries. The mountain Martinské Hole has also become a big tourist destination; its slopes had been developed for cross-country and downhill skiing. With the opening of a new Kia Motors Company in the region, many Koreans have relocated here. Korean cuisine is therefore available in the area as well as specialized and larger supermarkets. 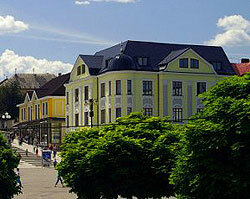 Like most Slovak cities, Zilina City has a preserved historic town centre and a mix of urban, suburban and rural areas. Zilina sits in the Váh River Valley in the northwest of the country near the Czeck border. Points of interest are the medieval Budatín Castle near the Váh River, several 16th and 17th century burgher houses surrounding the town square, and the twin spires of the Church of the Holy Trinity and the Burian Tower. Martin City is one of the great centres of Slovak culture. The Matica Slovenská, an educational and cultural institution that focuses on Slovak matters, was founded in Martin and has since spread to other cities. Within the city walls can be found the headquarters of the Matica Slovenská, the National Museum, and the National Cemetery. A well preserved Slovakian village near Martin City has been restored and presented as a museum for everyone to visit. Its pastoral atmosphere gives visitors a glimpse of the simplicity and beauty of the past.